ArcGIS for Mobile: What types of GPS does ArcGIS for Windows Mobile support? What types of GPS does ArcGIS for Windows Mobile support? So I rushed back to my PC and started searching. Here is the result of my investigation. First of all, what is GPS? Very briefly, GPS ou Global Positioning System is a space-based satellite navigation system that provides location and time information anywhere on or near the Earth. There are two main frequencies that the systems broadcasts position information, one for military proposes and one for civilian use. The first as better accuracy and the civilian one can have errors of up to 100 meters. Each GPS satellite transmits location messages in a protocol known as NMEA or National Marine Electronics Association. To improve the accuracy of the civilian GPS applications there are enhancements to the GPS system. These are A-GPS, RT-GPS, D-GPS, WA-DGPS, RTK and PP-GPS … and some more. Here are a few. A-GPS or Assisted GPS is a way a mobile device can use to get a faster GPS satellite fix. This technique uses network resources such as GSM or Internet to get an approximate position. It is the responsibility of the mobile device to support this feature. D-GPS or Diferencial GPS can bring accuracy up to 10 cm. D-GPS uses a network or fixed ground-based reference stations to broadcast the difference between the positions indicated by the GPS satellite systems and the known fixed positions. The connection to this ground stations is done by a network connectivity. The device receives and processes the normal GPS positioning messages and the applies the offset given by the nearest ground stations. There are European DGPS Network and United States DGPS Network, among others, that you can connect to. WA-DGPS or Wide Area DGPS (also called SBAS - satellite-based augmentation system) is similar to D-GPS but the offset is calculated and transmitted by orbiting satellites to ground stations. The process for correcting the position on the device is similar to D-GPS. EGNOS is the European Geostationary Navigation Overlay Service and WAAS - Wide Area Augmentation System developed and maintained by the Federal Aviation Administration in the US. PP-DGPS is Post-processing used in Differential GPS to obtain precise positions of unknown points by relating them to known points. The GPS measurements are usually stored in computer memory in the GPS receivers, and are subsequently transferred to a computer running the GPS post-processing software. The software computes baselines using simultaneous measurement data from two or more GPS receivers. RTK or Real Time Kinematic is a real time offset calculation technique that can bring accuracy up to millimeters. 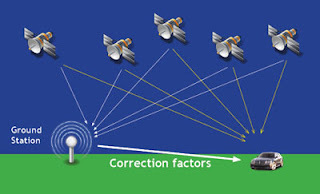 This technique uses a second receiver on the device (usually UHF) to receive the correction signal from ground stations. There are a few more correction techniques and protocols that help you improve your GPS accuracy, but these are the most common. Now, from all the above which does ArcGIS for Windows Mobile support? First of all ArcGIS for Windows Mobile supports only the NMEA protocol. Then the final answer is... all of them! Execept PP-DGPS (Post-processing DGPS). It is up to the mobile device to support and proccess the signals corrections and enhancements. The final corrected NMEA sentence is then forwarded to a COM port on the device. Then on ArcGIS Mobile GPS settings menu you just select the correct one. The ArcGIS for Windows Mobile commons questions page also has a few more answers like What GPS devices does ArcGIS for Windows Mobile work with? or Does ArcGIS for Windows Mobile support differential GPS?